During the first week of May, President Obama’s National Security Council (NSC) Advisor Susan Rice met with Ugandan President Yoweri Museveni in New York City. NSC spokesperson Bernadette Meehan then released a statement about their conversation. U.S. National Security Advisor Susan Rice greets Ugandan President Yoweri Museveni in New York City on May 5, 2015. Ugandan American journalist Milton Allimadi, writing in the New York City-based Black Star News, called the NSC release “newspeak on steroids” and said, “The cynicism and utter disregard for the lives of millions of Africans in Congo, Uganda, Rwanda and South Sudan must end.” This is a conversation with Milton Allimadi. Ann Garrison: Milton, before we talk about this conversation between Susan Rice and Yoweri Museveni, could you say something about why the news from this part of the world is so often, as you said, like “newspeak on steroids”? And why, no matter how ridiculous it gets, the Daily and Nightly Shows don’t satirize it and almost no one reacts except for a handful of indie publications, like The Black Star News, who are committed to covering Africa? Milton Allimadi: Yes, and that’s the really sad thing about it, Ann. Africa news, particularly when it involves people from the region usually referred to as Sub-Saharan Africa, does not garner much attention in the United States. It’s not taken seriously by the major news organizations. So that’s why Susan Rice is able to say preposterous things concerning the region and basically get away with it. She would not be able to make similarly preposterous statements concerning the Middle East or the conflict in the Ukraine or any other part of the world. MA: Absolutely. Look at it. First of all, she’s sitting there with Gen. Yoweri Museveni, who, as we know, is actually the principal architect of the devastation, of both the humanitarian crisis and the economic destruction. The South Sudan conflict, the recent version of it, started in December 2013 when there was a power struggle between President Salva Kiir and Riek Machar, his vice president. President Kiir tried to arrest Vice President Machar and failed. Then he said Riek Machar had tried to conduct a coup d’état, but that does not seem to be true; and much of the army then deserted Salva Kiir and went to Riek Machar’s side. At that point, Yoweri Museveni intervened militarily on the side of Salva Kiir and that’s where the mayhem started. And now Obama’s national security advisor is sitting down with this same Museveni and saying, “Lo and behold, look at all this devastation in this region,” as if he did not play a role in it. It’s mind boggling and it’s preposterous. AG: A few months ago the Sudan Tribune reported that there were 7,000 more Ugandan soldiers in South Sudan. Uganda immediately denied it. The U.S. certainly knows whether or not this is true. The Satellite Sentinel Project, for one, sends data to the U.S. Africa Command and the CIA and DIA; and the Ugandan army is one of AFRICOM’s most useful partners, so there’s no way they wouldn’t know, satellite or no. But the U.S. didn’t even comment. MA: That’s because it’s true. If you read the Sudanese papers – the South Sudanese papers and the social media where South Sudanese are talking about what they’re experiencing – it’s quite clear that what we have in South Sudan is not really a civil war anymore, since a substantial part of the army have abandoned Salva Kiir and accused him of mortgaging the country to Uganda. So what we have in South Sudan is a conflict between an invading army, Gen. Museveni’s army and a South Sudanese army. They’re fighting against occupation. And Salva Kiir is merely a puppet of Gen. Museveni right now. AG: OK, now what about what Susan Rice said about “the need for the international community and South Sudan’s regional partners” to “work quickly to achieve peace in the face of the intransigence of the country’s leaders”? MA: Well, she’s admitting that Salva Kiir is not in fact president of South Sudan anymore. So she has to find a rationale for foreign intervention, when in fact the foreign intervention occurred in December 2013, when Uganda invaded South Sudan. It’s becoming untenable to try and cover this up and pretend it’s a civil war. And that’s why I think this U.S. administration is finally trying to go public, to acknowledge an intervention in South Sudan, but pretending that it’s something that’s just about to happen, when it happened in 2013. And it’s been a disastrous intervention. Human Rights Watch has said that the Ugandan army may have actually used cluster bombs in South Sudan, and those are internationally banned. So how could the U.S. be on the side of an army and a country that is using banned armaments? AG: Well, I think there’s at least a partial answer to that. The U.S. is not among the states who’ve signed on to the international cluster bomb ban. MA: So the U.S. is saying that it’s fine for Uganda to use these weapons against the South Sudanese and for the U.S. to continue to ally itself with the Ugandan military and leader. Let me try an analogy. Since the U.S. did not have a national security advisor in the 1940s, it’s like Cordell Hull, who was the U.S. Secretary of State in 1943, going to Europe and meeting with Hitler and saying, “Whoa, look at all this devastation in Europe. The international community, including Hitler and Mussolini, should be involved in trying to stop this.” That’s how preposterous it is. 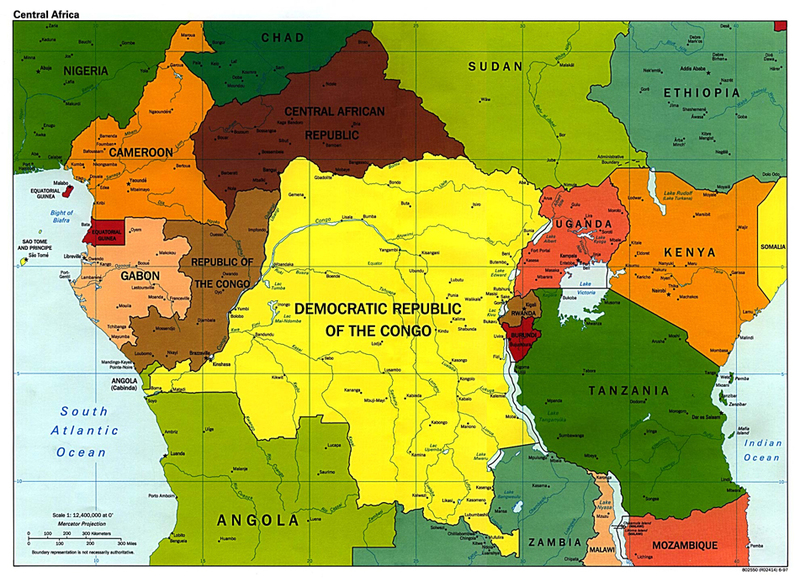 Those of us who follow the region closely also know that Uganda and Rwanda have been the primary aggressors behind the devastation in the Democratic Republic of the Congo. Their multiple invasions may have led to as many as 7 million deaths. And the multiple invasions of South Sudan have now caused a humanitarian crisis. We don’t even know how many people have died. We know that more than a million are displaced domestically. We know that more than 400,000 have fled the country. So we have more than 10 percent of the population displaced. It would be like 32 million Americans displaced from their homes or having fled the country. AG: And we should add that much of the death caused by war in this part of the world is death by refugee camp, where people are often trapped without food, water, sanitation or the most basic medicines to treat easily curable diseases. MA: Absolutely, and as you can imagine, it must be a very awful and drawn out death, where you have parents, particularly mothers, just watching their young ones withering away and dying because of something that they’re helpless to respond to, something they can’t do anything about. AG: On May 13, the U.N. reported that the U.N., the International Red Cross and other NGOs are withdrawing relief workers because of the violence. MA: So the human crisis will get even worse. MA: Yes, that’s another preposterous statement because, as we know if you look at the Ugandan media, no one’s talking about the Lord’s Resistance Army anymore. The Lord’s Resistance Army has not operated in Uganda for years. It’s essentially a spent army hiding in the jungles of the Central African Republic, but that statement, which reads like a press release sent out by a PR firm, gives the impression that the LRA’s still causing havoc inside Uganda. Far more recent havoc has been caused by M23, the notorious army that was trained, financed and equipped by Uganda and Rwanda and commanded by the Rwandan Defense Minister James Kabarebe. M23 committed horrific war crimes and atrocities in 2012 to 2013 in the Democratic Republic of the Congo and then, when they were defeated by the special U.N. Force Intervention Brigade, “withdrew” into Uganda and Rwanda. AG: That was another example of newspeak on steroids, in 2013, when the wire services reported that M23 had fled across Congolese borders and surrendered in Rwanda and Uganda. That was like saying that the Confederate Army had fled back into the South to surrender to Robert E. Lee. MA: Exactly. And as we speak today, the leader of M23, Sultani Makenge, is being accommodated in Uganda by General Museveni. And recent reports say that some elements of M23 may have been deployed with Ugandan soldiers in South Sudan. AG: M23 is also reported to have returned to eastern Congo with a new name, “Mouvement Chretien Pour La Reconstruction Du Congo (MCRC).” They already have a Facebook page. MA: Yes, these Rwandan and Ugandan militias in Congo have been changing their names and acronyms for nearly two decades, and that convinces outsiders that they’ll never be able to understand the complexity of the Congo conflict. Rwandan President Paul Kagame toasts Ugandan President Yoweri Museveni. AG: News 24, in its description of this meeting between Susan Rice and Yoweri Museveni, said that it highlighted Uganda’s role as “one of the most militarized powers in Africa.” How did Uganda get to be one of the most militarized powers in Africa? MA: Uganda became the most militarized power in that region because Uganda has played the sheriff’s role for the United States for many many years now. As you know, next year Gen. Museveni will have been president of Uganda for 30 years, so they’ve been able to equip his army, to train his officers and provide him with weaponry for the past 30 years. He’s been like the U.S. Sheriff in the region, intervening in the Democratic Republic of the Congo, intervening in South Sudan, intervening in Somalia, and intervening in the Central African Republic and intervening in Somalia, essentially serving as the proxy army of the United States. And it’s an army that has been engaged in many war crimes. There’s a very interesting article that has not gotten sufficient play, in the Wall Street Journal, June 8, 2006, which said that the government of the DR Congo had actually referred allegations of war crimes committed by Uganda’s army to the International Criminal Court, which then launched an investigation, and that Gen. Museveni himself urged U.N. Secretary General Kofi Annan to block that investigation. Uganda became the most militarized power in that region because Uganda has played the sheriff’s role for the United States for many many years now. And even though, according to the Journal, Annan said he did not have those powers, somebody certainly has those powers, because Gen. Museveni has never been investigated for war crimes in the Democratic Republic of the Congo. AG: I don’t think we should leave out Rwanda 1990, which was actually a Ugandan invasion and war that continued for years, until Rwandan President Juvenal Habyarimana finally agreed to negotiate with the invaders, which gave them the status of civil war combatants. In fact, when the Ugandan invasion occurred in 1990, France tried to make it an issue for the U.N. Security Council, but the U.S. used their veto power to block U.N. action, giving Museveni the green light. And the ultimate consequence of that invasion was the death of as many as a million or more people, although studies recently featured in the BBC documentary, “Rwanda’s Untold Story,” suggest that there was a radical undercount of Hutu Rwandan deaths in the massacres so long described as a genocide of Tutsi Rwandans. AG: Milton, anything else you’d like to say? MA: Yes, I think this is a very sad testament as to how the press covers Africa and to how much easier it is for a national security advisor who is African American, like Susan Rice, to coddle a dictator like Yoweri Museveni without any charges of racism. She blithely ignores that he has been responsible for the death of millions of Africans, and that is no exaggeration. Milton Allimadi is the editor of the Black Star News and author of “The Hearts of Darkness: How White Writers Created Racist Images of Africa.” He can be reached at milton@blackstarnews.com. Ann Garrison is a radio producer for Pacifica’s KPFA-Berkeley and WBAI-N.Y.C., a contributor to the San Francisco Bay View, Black Agenda Report, Black Star News, Counterpunch and Global Research and winner of the 2014 Victoire Ingabire Umuhoza Democracy and Peace Prize. She can be reached at ann@afrobeatradio.com. Crime should not be accepted! We should stand against the terrorism. I appreciate them to work together against crime.